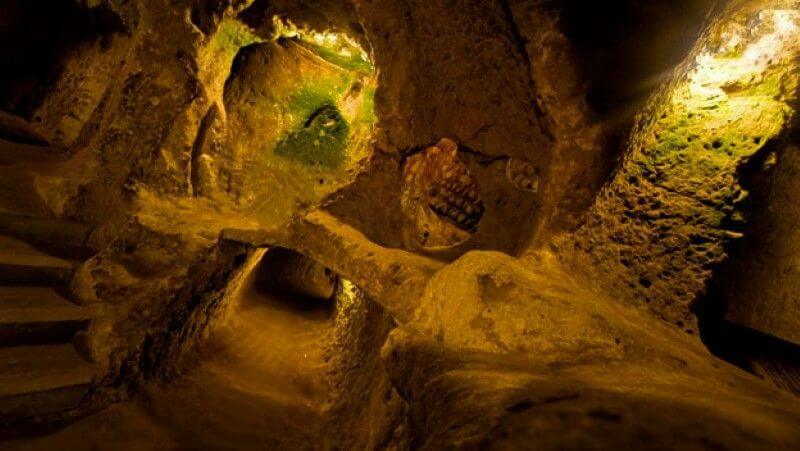 Derinkuyu Underground City was discovered in 1963, when a modern, aboveground home in Derinkuyu was being renovated. The renovations led to the discovery of a cave that led to the underground city. It was an astonishing discovery, considering it is the biggest of all the excavated underground cities in Cappadocia. It goes 280 feet into the ground, contains thirteen stories and can fit roughly 20,000 individuals, according to a History Channel Ancient Aliens presentation. According to other sources, it could fit as many as 50,000 people. It contains wineries, storage space, living quarters and even stables for keeping livestock. Ventilation shafts bring air from above and roughly 15,000 smaller shafts distribute that air throughout the city. The age of Derinkuyu is hard to determine, though the most popular estimates put the date of construction between 1,000 and 800 B.C.E. We do know of later civilizations staying in the Derinkuyu Underground City, particularly early Christians. However, there is no clue as to who built it and why. There are seemingly no artifacts from the time of its building. Furthermore, the structure itself cannot be dated as it is carved right out of the landscape. There is no quarry to investigate, apparently no contemporary texts on the subject and not even an oral record of its construction. The very fact that it is underground suggests that the Derinkuyu Underground City was built as a shelter for residents of the homes aboveground. Its later use as just that only cements the theory. What is interesting about this theory is the sheer size of Derinkuyu. To construct such a massive shelter, there had to have been a good reason. War and other social turmoil could explain it. It could protect from certain natural disasters as well. Whatever the case, the amount of foresight and effort that went into Derinkuyu would rival even modern emergency shelters, if that was its use. Building an emergency space for tens of thousands of people that is specifically for that use is not modern practice. Another argument for Derinkuyu as a type of emergency shelter that protected its occupants from other people is its security system. The entrances to the city have large stone doors that can only be closed and opened from the inside. Each level is also protected by such doors. Now, this does suggest it was built to keep other people out. However, modern homes have locks. If people lived down there permanently, they might have had similar security. An argument against Derinkuyu as a shelter is that it would have been easy to suffocate the people inside by closing up the ventilation shafts. The problem with this argument is that Derinkuyu was used for precisely that purpose later and there is no record that this ever happened. Even if it were used for everyday use, this would have been a weakness. The most likely explanation is that there was no way around this structural Achilles heel. There may have been greater hope of the enemy failing to find all of the shafts than there was of surviving an open attack aboveground. There may have also been warriors defending the city at ground level. At this time, there is no way of knowing. In fact, there may never be any way of knowing. The city was occupied by people other than its builders later, effectively erasing whatever they may have left behind. One thing is certain, though. It made much more sense as a shelter than as a permanent dwelling. There were plenty of options for homes above ground and even ancient man appeared to know that open, clean air and separate dwellings for animals was the only way for a civilization to thrive. The Underground City of Derinkuyu is an ancient multi-level underground city in the Derinkuyu district in Nevşehir Province, Turkey. It is on the road between Nevşehir and Niğde, at a distance of 29 km from Nevşehir. With its thirteen floors extending to a depth of approximately 85 m, it was large enough to shelter 30,000 thousands people together with their livestock and food stores. It is the largest excavated underground city in Turkey and is part of a network of several underground complexes found across Cappadocia. Derinkuyu Underground City is one of several underground cities in the Cappadocia region of Turkey. Cappadocia itself is a natural wonder that civilizations throughout history utilized for its landscape. The surreal vista of Cappadocia is dotted with stone volcanic chimneys known as “fairy chimneys.” People carved dwellings, churches and stables out of these chimneys and other stone in Cappadocia. There are even structures in the area that modern man refer to as castles, though they are very unlike European castles that the word typically brings to mind. In a way, wind, time, rain and construction techniques have rendered the structures of Cappadocia and the Derinkuyu Underground City something like an ancient above and belowground labyrinth with lines not unlike the homes of the Whos down in Whoville. EISENHOWER AND ALIENS + ALIEN COVER-UP: HAVE WE REALLY MET ET?